The cheery, comfortable and luxuriously furnished villas are spread out over the De Hildenberg country estate. You have the choice of seven different types: All villas have a bedroom and one of the two bathrooms on the ground floor. There are three 6 person thatched variants: the NL-8426-04, -05 and -08. There are two types of tile roofed villas; De NL-8426-06 (there is one villa which has one bathroom) and the NL-8426-07. There are also stately executive villas. There is also a 6-pers. (NL-8426-05) and an 8 pers. 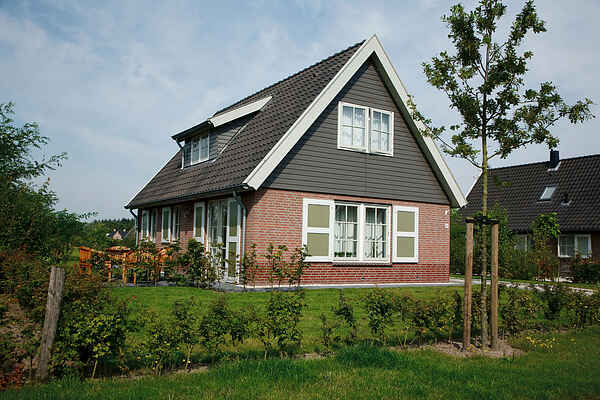 (NL-8426-10 with two bedrooms with their own bathrooms on the ground floor). All villas have a garden with terrace and garden furniture. You have two parking spaces per villa.